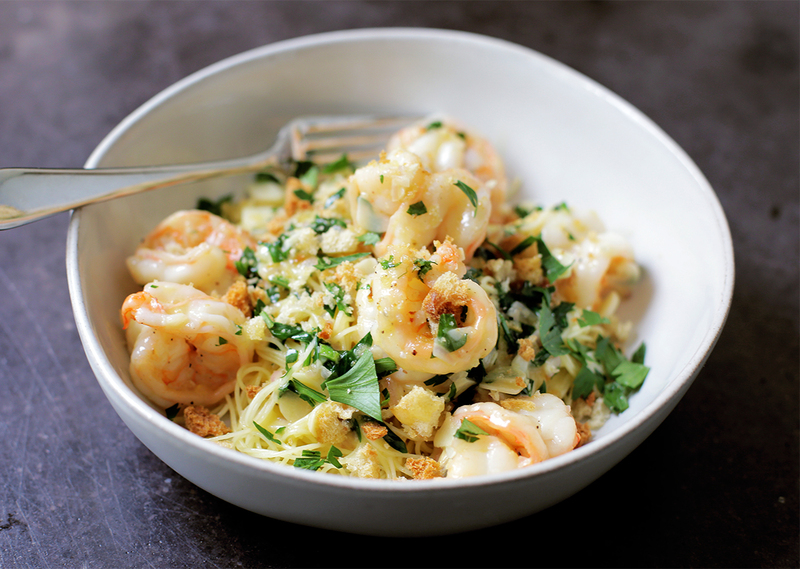 For this butter- and garlic-infused Italian-American scampi, buy the best shrimp you can find because the success of the dish hinges on the quality of the seafood. I like to use a mix of herbs, along with anise-flavored Pernod instead of white wine, for a unique flavor boost. Adding a healthy dose of crunchy seasoned bread crumbs brings it all together with the perfect textural contrast. Preheat the oven to 375 degrees F. In a food processor, pulse the bread with the parsley, olive oil, zest and garlic until coarse crumbs form. Season with salt and pepper, then spread on a large rimmed baking sheet. Bake for 7 to 10 minutes, until golden and crisp; let cool. In a large pot of salted boiling water, cook the pasta until al dente. Drain the pasta. Reserve. Meanwhile, preheat a large skillet over medium heat and add the oil. When aromatic and rippling, add the garlic and shallots, and sauté until beginning to caramelize. Push the shallot mix to the sides, raise heat to high and add the shrimp. Cook until the shrimp have barely turned pink and just started to curl up, a few minutes at most. Add the herbs, toss and cook for a moment. Add the Pernod and cook until almost evaporated, then add the lemon juice. Swirl and add the butter. Swirl the pan until sauce has come together. Add the reserved pasta to the pan and toss to coat in the sauce. Season with salt and pepper. Serve, garnishing with the breadcrumbs.